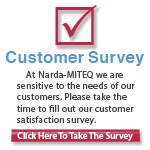 L3 Narda-MITEQ does not list the Operation & Maintenance Manual as a line item on a Sales Order. The Operation & Maintenance Manual for this product will be available for download immediately following shipment. To download a product manual, visit the Manual Downloads page and enter the Model in the search box.